I actually planned to write this post in early November but some family issues came up and I only have time to pen my thoughts now. Its December and by now the kids would have received their report books and the parents would have know how well their kids had performed this school year. Some may fare well and some not. After you have seen your child's result, before you scream your head off because she had fared badly or not up to your expectations, google for the popular tuition centres and starts to call them up one by one, take 3 deep deep DEEP breathe and CALM DOWN! Think calmly about the reason(s) for your outburst, anxiety, dissatisfaction with the result. What made you decide to ship your child to the Land of Tuition if you have not OR if your child is already in the Land of Tuition, what triggers your decision to change tuition centre or add MORE academic enrichment classes to her already busy schedule. 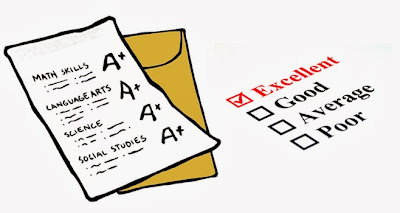 "What are my expectations of my child's academic results?" If you say that it must be good, then what is consider good to you? A score of above average or a score of more then 60, 80 or 90 marks? Let's look at Singapore Primary 3 to 4 School Achievement Band. This is not applicable to Primary 1 & 2 since the streaming starts at Primary 3 but in some schools Primary 1 students are being graded on the same scale so the teacher can gauge their performance. By looking at the above, anything that is 85/100 and above is consider very good since (1) it falls under Band 1, the highest grade for the Primary 3 to 4 grading and (2) Grade A for the Primary 5 to 6 grading. Ok, at least that is how I see it and set as a target for a start. So, decide on your expectations and set the grade that you want your child to achieve, realistically. You do not tell your child that she MUST score 100 marks for each subject when she is already scoring above 95 marks. Mind you, there are such parents out there! "What will my child gain if I send her to this tuition?" Thinking of the Expectations above, how will your child benefit from attending tuition? What do you want her to gain from attending tuition? Of course your child definitely needs extra help if her results are not good, in general context like when she failed that subject but if she is scoring over 90 marks per subject, do you think she needs to go for one? Or perhaps her good results (read - expectations met) will make you decide to drop some tuition classes? Either way, you might want to look into adapting the next action below as an alternative or as a reinforcement. "Am I willing to spend at least an hour each day to either coach my child with his schoolwork or do something with him?" By being involved with your child I do not mean that you pile loads of assessment books onto your child, leaving them to finish X number of chapters on each book alone. Its useless to just dump enroll your child with some tuition or academic enrichment classes without playing your part to reinforce what she has learned in school. It means you are sitting by her side, providing some support and guidance if she faces some problem in understanding her school work. Most of us are full time working parents but with a little bit of adjustment you should be able to set aside an hour or so each day to do that. We heard many parents complaining that the subject syllabus and teaching methods are totally different from our time, they absolutely have no idea how to teach their kids. I am sure the school has some parents support group (I know DinoBoy's school has such group) where you can find out on all the info. The internet is also a great place to find out info too, make full use of that and don't we all love Facebook friends who are always there 24/7 throwing us some lights whenever we post a question? An important lesson that I learned in my 7 years of parenthood is that it's ok to admit to your child that you do not know the answer (we are not a walking encyclopedia or walking Google after all!). They will not judge you but instead will feel inspired by you because you have the courage to admit it, took the effort to find out the answers and work together with them to solve the problem. Being involved does not only apply to your child's academic work, it also include every thing in their life from basic needs, emotional needs, material needs, spiritual needs etc. Are you willing to accept & embrace failure and disappointment? I seriously hope that you are not the same as Mummy #2 above. It is devastating for your child to hear such words coming out from someone they supposedly trusted so much and an action that will definitely crushed them entirely. If despite the "help" from the tuition, your child's result did not improve much, how will you react? Do you hit the roof like Mummy #1 above or you sit down to analyze the problem? There may be some underlying problem which you may not noticed it before. I am not saying there is "something wrong" with your child but perhaps she needs a different kind of help then attending endless tuition. I am and still is not pro tuition even though DinoBoy started Chinese tuition recently. So far DinoBoy is enjoying the lessons, getting along well with new friends and teacher. All work were given out and completed in the centre so no home work for the students to bring home but they have Chinese spelling every week. I guess having one of his schoolmates in the same class as him makes settling down easier for him. Then I signed him up for the Chinese Comprehension Holiday Enrichment classes that is being conducted every Wednesday morning. This means that I have to take leave for 4 Wednesdays to bring him to class but I get to spend the rest of the day with him either chilling out at home or going out for some fun. I wasn't enthusiastic about this extra tuition but I want him to get proper guidance from teacher in getting or finding answers to the questions then writing them down in a proper full sentence instead of blindly copying or just a 2 words answer. Also he will not starts arguing or become defensive when I question his answer, he will be more receptive on the teacher's guidance and words. Frankly, with only ONE tuition class to attend once a week, we are already feeling the strain from it. Maybe because it's on a weekday where all of us have already spent a day at work or at school, instead of going home to rest we have to rush to pick the boy up from school to go home first to deposit his super duper heavy school bag before heading out for a quick dinner then to the centre. All these have to be done in slightly more than an hour! Thank goodness we are staying near the centre so we save on traveling time. I shudders at the thought of going to more tuition classes and hope that this will not ever happen to us, I can guarantee you that DinoBoy will act out in protest with his outbursts and undesired behaviour. As an adult we are already feeling tired and frustrated with just ferrying the child to & fro the tuition centre. I am sure the child will feel double dosage of it since they are the one attending the lessons, they will most likely be both mentally and physically burnt out by the end of the day. 1. Never forget to encourage your child on the efforts they have shown and put in. 2. Continue to reassure them that you understand that learning journey are not easy and you will always be there to help him in every ways. 3. Listen to them, observe them. Are they being overloaded with schoolwork and tuition work? They are human not robots, they can only endure and take so much pressure and stress. 4. Show them loads of LOVE! yes.. i hope their chinese can improve then even they drain our energy dry i also don't mind. Totally agree with you about the last 4 points. They are not robots, if they were, we could just purchase all sorts of software and load it in. But they are not. :) And I appreciate and celebrate their individuality, and I think that is important for every child's well-being. Hi Rachee-O, I agree with you but you have to be careful though coz sometimes when they did not do good for a few times they will take it tt they cannot succeed and will think failing is a better option. Hi DinoMama, you are absolutely right not to let them think of failing as an easy alternative. I will still try to encourage ZZ to take small steps to make small improvements. Just for that "experience" of improving. I still try to strike a balance, while academics is important, but I think it's not everything. Shaping the child's character is actually most important, which makes me want to shout with joy with your latest book review and giveaway! Teaching compassion, empathy, tolerance and understanding brings out the true elements of being a person. And these are the things that I truly want to focus on for ZZ. Being different doesn't mean you are different. Who's in the right position to classify difference? There is a funny saying,"They laugh at me for bring different, but I laugh at them for being the same!" So....celebrate individuality! You are talking about The Colourblind Chameleon by Laura Kantor? Yes these are some of the basic elements that mould the child to be a better person. And yes, Celebrate Individuality Indeed! I agree with you on many points here. Love your 'chilll mom' comment. That's too funny. After all, kids go to school to learn academics *and* learn social skills; skills required for any human being. Thanks for dropping by Dr Tandy~ I agree with you that social skills are just as important as academic results. Some parents just don't see it and its their kids who suffer.
. Education and learning equal important in human life, Education helps person to stand in front of the society with a good moral value and also helps a person to get better upcoming future and financial secured throughout the life. But only education doesn’t help a person to become a good human being in life. To become good human being learning plays the most important role in life. As long as my child is having good education, I will do my best to support her.